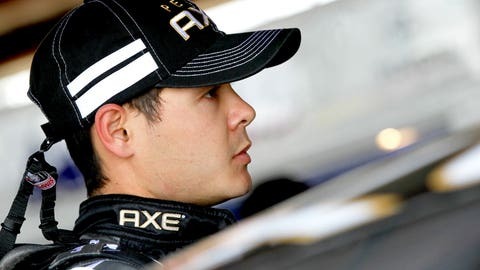 Chip Ganassi Racing driver Kyle Larson has enjoyed a strong start to his rookie season in the Sprint Cup Series. NASCAR Sprint Cup Series qualifying from Richmond International Raceway was cancelled Friday afternoon after severe storms rolled into the area. As a result, the field for Saturday night’s Toyota Owners 400 was set according to the results from Friday’s opening practice session, giving rookie Kyle Larson his first career NASCAR Sprint Cup Series pole. "I’m still happy with being on the pole," Larson said. "But yeah it would be nice to get a legit pole. I don’t know if we would have gotten it had it not rained. We worked all second practice on qualifying runs. We were seven tenths slower than our lap that we laid down in first practice and almost two and a half tenths slower than the fastest guy in second practice. I doubt we would have been on the pole, but I will take it how we get it." Brad Keselowski recorded the second-fastest time in the opening practice session and will start second Saturday night. This marks the sixth front row start in nine races for Keselowski. "We have been keeping the trend up here of starting up toward the front and that is something I am really happy abou." Keselowski said. "Pit road selection is important with that. Always here it is a track position battle but probably more so than ever here this weekend. We did some runs and felt like being in traffic would slow our car down tremendously. Starting up front hopefully we can just avoid it the entire race." Clint Bowyer, Kasey Kahne and Kevin Harvick will make up the rest of the top five, while Brian Vickers, Jamie McMurray, Ryan Truex, Paul Menard and Jimmie Johnson round out the top 10. Dave Blaney and Michael McDowell failed to qualify. Coverage of Saturday night’s race begins at 5:30 p.m. ET with NASCAR RaceDay on FOX Sports 2, followed by live coverage of the Toyota Owners 400 at 6:30 p.m. ET on FOX.